This publication is the last of a three-part series on spinner-disc spreader operation. 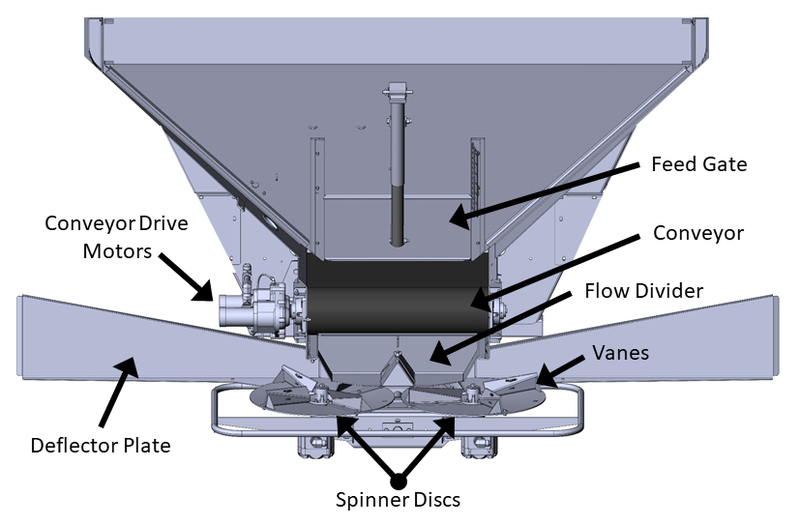 This series provides insights into proper operation, calibration, and spread uniformity assessments of commonly used spinner-disc spreaders. Spinner-disc spreaders are commonly used in commercial agriculture operations as a method to apply soil amendments in an economically conscious manner. Operating conditions such as terrain, soil surface conditions, environmental conditions (e.g. wind speed, humidity), spinner-disc speed (RPM), product characteristics (granule size, granule structural integrity, granule size uniformity) and varying ground speed can impact spreader performance. It is important for the operator to review the operator’s manual to become familiar with the applicator and ensure adjustments, maintenance, and repairs are handled appropriately. This publication outlines several operational tips, along with the terms and definitions used in the previous two parts of this three-part series on spinner-disc spreaders commonly used in agriculture. 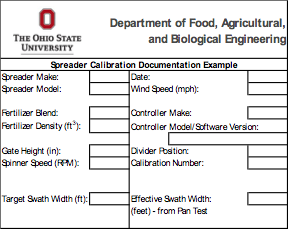 Figure 3: Example calibration sheet that documents important information that needs to be recorded and stored. Be sure to maintain records about calibrated settings for each product, at each operational swath width that is planned to be used. Important things to note include: fertilizer blend, density, gate height, spinner speed, divider position and calibration number. This information becomes important when setting up a spreader each year or when changing products. In-cab displays, such as Raven, AgLeader, TeeJet, Topcon, and John Deere Greenstar can store setups and calibration settings, but keeping a written or electronic record is important to verify proper settings while switching between various products. Below is an example of various parameters that should be documented each time a calibration takes place. Accurate record keeping is essential in all aspects of farming operations, especially fertilizer application. The ability to show that a spreader was calibrated before an application is very valuable in any type of legal setting. Practicing good documentation of spreader calibration and documenting operating conditions before every spread is a way to ensure that your farm is always protected. Each time a different material is spread or the rate of application is changed, assess the new spread pattern and make the necessary adjustments. The following tips and considerations are helpful to reference prior to applying dry fertilizer either as a blend or as an independently metered product. Replace worn and bent spinner-discs and/or blades. Level spinners with respect to the rest of the machine. Remove buildup of fertilizer and lime on spinner-discs and/or blades. Replace corroded and rusty hoppers and components. Check if spinner-disc RPM matches the rate controller setting with handheld tachometer. Below are some operational considerations and concepts, be sure to reference these before spreading. Density—Fertilizer particles of various N-P-K compositions will have drastically different aerodynamic properties. Thoroughly blended fertilizers and other materials of uniform particle size will give the most even application across the swath. Test fertilizer density with an in-field density measurement device. Refer to ohioline.osu.edu/factsheet/fabe-5501 for a detailed discussion of the effect of fertilizer material properties on spreading, in addition to a density chart of commonly applied fertilizers (Fulton & Port, 2016). Spinner-Disc Speed—Periodically, the spinner-disc speed (RPM) should be verified using a handheld tachometer. This check confirms the spinner-disc speed shown on the in-cab display is accurate. Significant variations in spinner-disc speed can cause pattern skewing and non-uniform distribution. Segregation—Blended fertilizers of varying particle sizes can segregate in the bin during operation. When possible, it is best to select materials for blends that are approximately the same particle size, shape, density, and moisture level. Vertical baffles in gravity bins are effective in preventing segregation. Avoiding long transportation of blended fertilizers is desirable for limiting such segregation in the bin. Swath Width—Also known as spread width or swath spacing should be consistently maintained in order to prevent too much or too little overlap between swaths. If not already being used, guidance systems greatly reduce error and operator fatigue. When practical, drive spreaders around fields in a perimeter or circular pattern to minimize the effect of variations in spread patterns. Proper Setup—Use the previously recorded calibrated settings for a particular fertilizer. Remember to adjust the product density within the in-cab display setup. Operate at the specified swath width to ensure correct overlap with adjacent passes. Double check your records from previous calibration tests to ensure other settings are correct. Terrain—Be mindful that applying on steep slopes can lead to high application rates on the downhill side unless properly accounted for with an effective flow divider. Proper swath overlap or a circular pattern application can, in some cases, compensate for this skewed application. Weather Conditions—Check the local forecast before spreading fertilizer to avoid exposing the fertilizer to moisture before being spread. Remember, even with proper adjustment, it is difficult to maintain a completely uniform and accurate application rate of granular fertilizer if wind speeds exceed 15 mph. 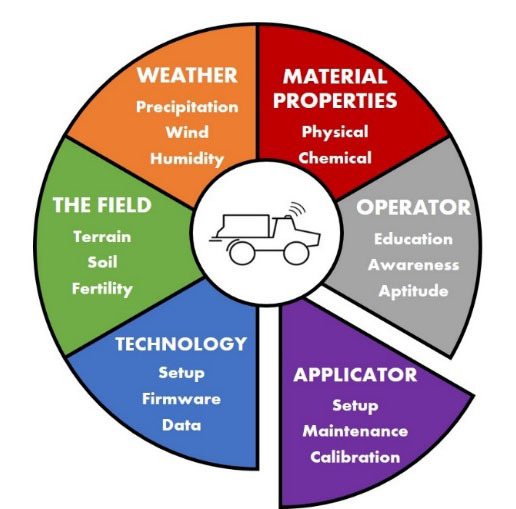 All of these considerations, along with detailed record keeping will lead to a substantially more uniform fertilizer application and reduce in-field variability and maximizing yield. Application Rate—the observed rate of application (product mass over a given area, e.g. lb/acre, kg/ha, ton/ac). Collection Pan—basin to collect fertilizer particles during spread pattern assessment tests, should be between 1 and 3 ft2 in area, 4 to 6 in. deep. Conveyor Drive—used to accurately meter product out of bin and onto the spinner-discs. Deflector Plate—ensures fertilizer is evenly distributed across the swath and not hitting the spreader body. Effective Swath Width—observed effective spread that allows for a uniform application of material when the pattern is repeated across the field. Feed Gate—a mechanism on the rear of spinner-disc spreader that allows for the feed of product to be controlled based off of feed gate height level. Flow Divider—used to split material flow equally onto the disc and control the placement location onto the discs. Gridded Baffle—inserted into collection pan to prevent fertilizer particles from bouncing out during pan testing. Ground Drive Spreaders—spreader types that are controlled by the ground speed of the drive tires on spreader (common for small pull-type spreaders). Hydraulic Drive Spreaders—also known as independent drive spreaders, are spreaders equipped with hydraulically driven spinner-discs, usually capable of variable rate applications. Pan Test—a method of determining the spread pattern characteristics for various spinner-disc spreader settings, target application rates, and products. Spinner-discs—used to deliver the product received from the conveyor to the ground. Spread Pattern—measured quantity of fertilizer distributed over a certain area, usually determined with pan test. • Flat Top Pattern—a ‘plateau’ shaped spread pattern that is acceptable for spreader operation if proper swath width is used. • Oval Pattern—a ‘half-moon’ shaped spread pattern that is acceptable for spreader operation if proper swath width is used. • Pyramid Pattern—a ‘triangle’ shaped spread pattern that is acceptable for spreader operation if proper swath width is used. • ‘M’ Pattern—is characterized by a spreader that applies a product too light directly behind the spreader. Application on the left and right sides of the swath pattern have higher amounts of material which can lead to nutrient streaking throughout the field. • ‘W’ Pattern—unsatisfactory because of a very high application rate directly behind the spinner, low rates between the spinner and the edge of the swath, and high application rates at either edge of the swath. • Skewed Type—characterized with either a heavier application rate towards the right or left. Swath Width—the effective width of the spread pattern measured perpendicularly to the direction of spreader travel. Can be adjusted for optimal spread uniformity depending on the type of desired spread pattern. Tachometer—a handheld device that measures the rotation speed of the spinner-discs (RPM). Target Application Rate—the desired rate of application for product mass over area (lb/acre, kg/ha, ton/ac). Vanes/Fins/Blades—mounted on the spinner-discs in order to deliver the material being spread to the ground, can be adjusted to change spread pattern. Variable-Rate Application—increasing/decreasing the target application rate based on production zones. Uniform Spread Pattern—an acceptable spread pattern that will produce an even spread across multiple swaths when delivered to the whole field. See continued discussion on spreader set-up, calibration, and spread pattern corrections in Part 1 and Part 2 of this three-part series. Fulton, J. P., & Port, K. (2016). Physical Properties of Granular Fertilizers and Impact on Spreading. Ohio State University Extension, FABE-550.1, 9.